After meeting widespread ridicule for a lofty first attempt at brand advertising in 2012 (and subsequent stumbles pitching its Facebook Home product), the social network has quietly been rolling out ads online this year that are quite a bit more grounded. And they focus more on promoting the core utility of the social network—in particular, its role as a motivator for non-virtual self-improvement. Don't worry, the campaign, created by Wieden + Kennedy, doesn't wholly commit to the mundane. One spot insists on emphasizing the calculated quirkiness of a group of young adults acting like teens. They have decided to drill skis and snowboards to the bottom of couches and ride the makeshift toboggans down a slope. This is apparently a real thing that someone, somewhere has done before. That lends a little credibility to Facebook's point that it will help organize even the most oddball of gatherings. Another spot focuses on using the network to crowdsource recommendations for a tango teacher, who turns out to be a charming, colorful personality. 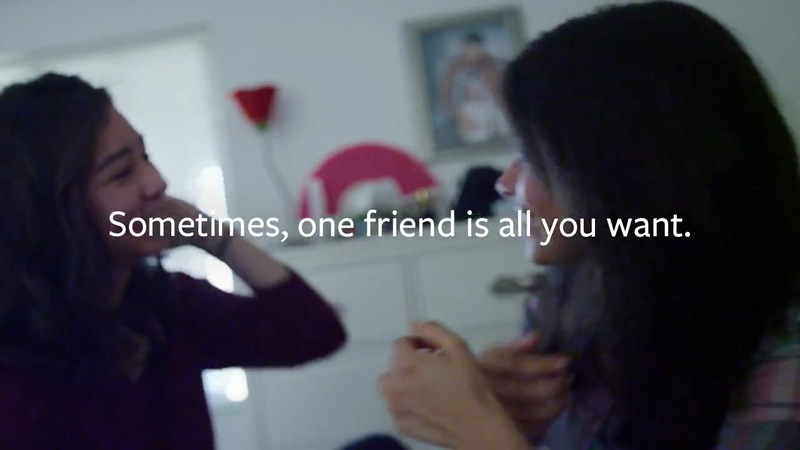 Other ads highlight an aspiring marathon runner, whose many friends encourage him through the network, and a girl who's going through a breakup, who only needs one friends to make things better. The spots do a solid job of using specific examples to illustrate Facebook's real value—its efficiency as a way to communicate with more than one person at once. That won't answer any grand existential questions, but it does get out of its own way and shows, concretely, how the product can help make life off-screen better—a concept Facebook has struggled to articulate in the past. That is, if making life better is defined as making it easier to sucker people you met once into watching you go sledding, or get shopping advice, or go fishing for affirmation.